Saving low-income housing in downtown SLC. With construction crews still chewing up much of the city-center scenery in anticipation of City Creek’s open-air mall and condos, downtown is on the rise. Within a stone’s throw of City Creek, however, a new development at 235 and 257 State Street is taking shape—on blueprints at least—that will resurrect historic buildings like the Rex Theater and the Cramer House. It will include street-level retail shops, office space, market-rate housing and even subsidized low-income housing—all in the east 200 block of State. Developer Ben Logue of the LaPorte Group has secured a proposal with the city that would carve out a niche for everyday folks to live and work in the city center—and now everyone from low-income advocates to city council members are high-fiving one another over the development. The only trick will be financing the project with the economy still swirling around the drain. “The forces of good have won out,” says Salt Lake City Councilman Luke Garrott, whose District 4 includes the development site. “[Logue] is a developer who has his heart and money in the right place and really shares a vision of downtown that includes affordable housing and historical preservation." 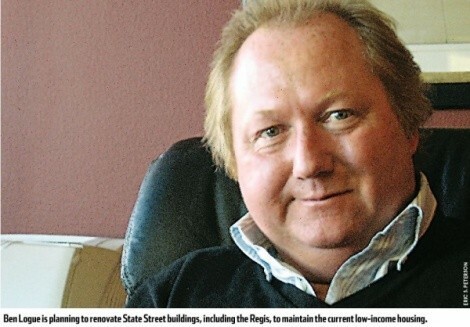 Logue’s commitment to affordable housing is especially reassuring for the 35 or so remaining residents of the State Street single-room occupancy hotel the Regis, one of the buildings to be renovated. While these down-and-out tenants temporarily will be displaced by the redevelopment, the LaPorte Group will be offering these residents housing at the firm’s other subsidized housing, the Stratford Apartments at 175 E. 200 South. Not only that, but after the Regis has been renovated in 2010, the displaced tenants are slated to be at the top of a list to move back into the newly renovated building and pay a rent comparable to what they paid before the dilapidated building’s extreme makeover. In a recent meeting, representatives of the Laporte Group addressed a small group of Regis tenants about the plans to demolish the hotel while also offering them replacement housing at the Stratford. While tenants at the meeting were pensive and held back most questions, low-income advocate Tim Funk didn’t hesitate to express the anxiety some tenants have felt in their dealings with the city. “You have to understand that [officials at the Redevelopment Agency] have been absolute clowns in the way they’ve dealt with these guys,” Funk tells a LaPorte Group representative. In the past months, Regis residents who did not move to the new Palmer Court housing facility at 999 S. Main have complained about the RDA giving infrequent communication about when they would be forced out as well as they´ve had to deal with an exacerbated pest problem that came about when the city dragged its feet in disposing of bedbug-infested mattresses left behind by residents who did relocate [see “Bug Infested SROs,” Sept. 23, City Weekly]. But LaPorte Group did not win the bid simply because the developer is going to bat for the low-income residents, says RDA Director D.J. Baxter. The Rex Theater, adjacent to the Regis and Cambridge hotels, will be renovated. The plan calls for a sevenstory building to provide a mix of office space, market-rate housing and 78 subsidized, low-income units, along with ground-level retail shops. Logue even envisions creating an open-air arcade between the currently connected Regis hotel and Children’s Theatre that will lead to a small amphitheater in the alley behind the buildings that could be available for poetry readings or community theater. Ironically, Baxter says that unlike calls for proposals issued two years ago, the most recent request for redeveloping the buildings did not require historic preservation. Initially, Logue did not throw his hat in the ring, admitting he felt the city was more interested in high-rise luxury condos. “The city awoke and said, ‘Let’s try and preserve some of the culture; let’s look at this with eyes wide open,’” Logue says, adding that it was his fault he did not vie for the project earlier. While Logue’s firm won’t be building skyscrapers on State Street, finding funds for the project still will be a challenge. Logue’s experience for the past 12 years has involved arranging varied funding sources that include federal allocations for low-income housing. In this project, Logue says his firm will rely on as many as 14 different funding sources to finance the State Street redevelopment—many of them bank tax credits. Garrott expects the costs to fluctuate as the project gets closer to fruition. “[Logue´s] mix is going to change, as investors are fickle,” Garrott says. Still, Garrott can’t help but be optimistic about the project. While juggling a myriad of funding sources to provide this kind of housing may make development a difficult enterprise, there are other reasons why Logue finds the work profitable.